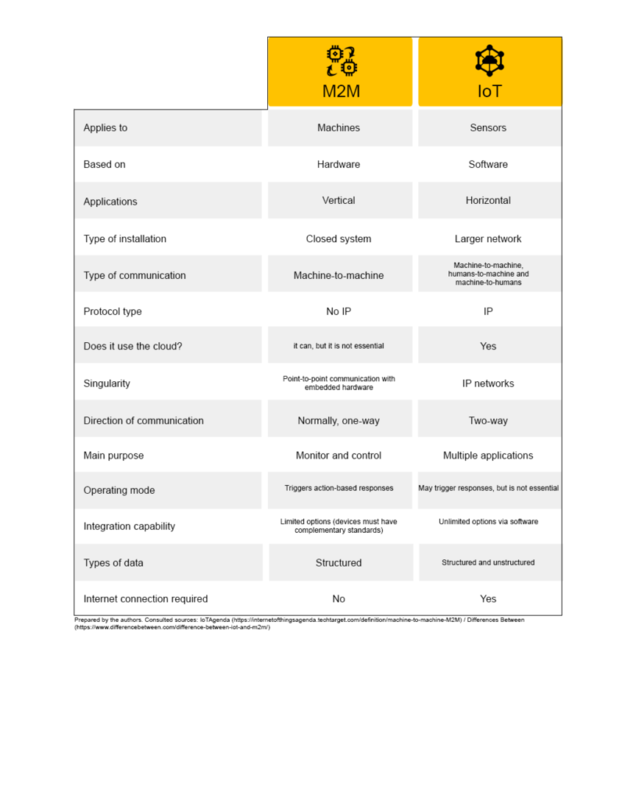 Which is the difference between M2M and IoT? M2M and IoT are two terms that have arisen great interest and generated several literary works in the last years, but there is great confusion and certain wear due to the abuse of the terms. Although both concepts have in common that they are used to share information between devices (in fact, certain authors suggest that IoT could be considered as an evolution of M2M, although others assert that M2M is a subset within IoT), their main difference is perhaps how they do it: while M2M makes reference to communication point by point, i.e., established between an emitter and an recipient thanks to a hardware module inserted within the machine, IoT is based on IP networks based on standards to interconnect data from devices and a cloud platform or middleware, which is the «software providing services to the applications». 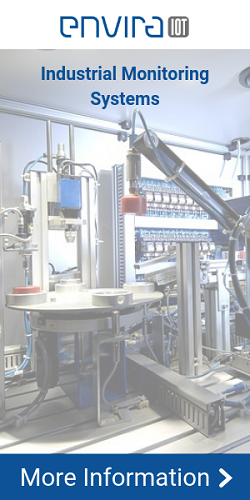 Communication machine-to-machine (M2M) can be defined as any technology allowing the devices connected to exchange information and perform actions without human intervention. However, an authorized operator can access the information and reset the machines according to the information gathered (an example would be predictive maintenance plans). In a certain way, it is essentially a business solution connecting companies with their machines, allowing remote monitoring and administration. This kind of technology is closely related to the so-called vertical applications, that is, those specific systems designed to monitor or control different variables in a single market or for a specific client. On the other part, the internet of things or IoT, as Luis del Barrio, marketing manager in The Mail Company, remarks at the website Manutención y almacenaje (Maintenance and storage), would be «the potential interconnection of all smart objects, M2M and the way in which they interact with society, connecting the physical and the digital worlds». It is a much wider concept linked to horizontal applications, which may imply, for example, an analysis of the data gathered and the consequent start-up of an action/response/reaction protocol. Summing up, IoT would be the axis connecting the M2M vertical solutions. In this way, current and inherited systems can be put together (this is very important when working in an industrial field, where machines are not updated very frequently). The following image represents the relation M2M-IoT in Industry 4.0, a sector where Envira IoT offers multiple solutions. Apart from the one mentioned at the introduction, which this paper considers one of the most important, there are other differences between both systems. Connectivity: while the M2M connects machines by using wired or wireless systems, IoT connects devices with the cloud. Access to information: the M2M systems are built on proprietary applications, not open source standards, and their purpose is not the free access to the information. The internet of things, however, has been designed based on interconnectivity criteria and open standards, making it possible that the information exchanged be accessible from different platforms or devices. Interactivity: one of the main advantages of IoT in comparison to M2M is its capacity to interact by means of bidirectional communications. M2M, however, is based on unidirectional communications. Scalability: IoT, being based on cloud architecture, has much higher scalability than M2M, which is more limited because it is based on wired connections or SIM cards.